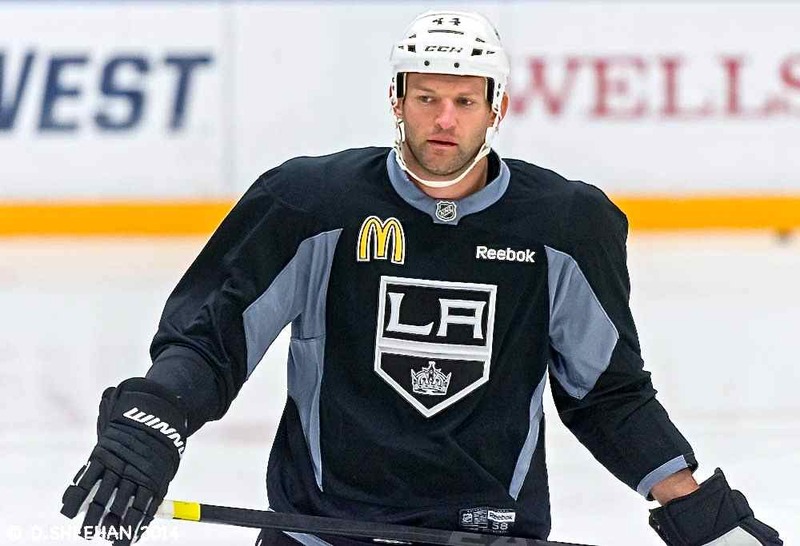 Los Angeles Kings defenseman Robyn Regehr, shown here during a recent practice at the Toyota Sports Center in El Segundo, California. EL SEGUNDO, CA — When we last left the Los Angeles Kings, they had just defeated the Columbus Blue Jackets, 2-1 in overtime, on February 6, at Staples Center. The win ended a four-game losing streak. But looking at the bigger picture, there were still a lot of things in their game that were broken, as their 6-13-2 record over their last 21 games indicates. Center Mike Richards hopes that the Olympic break gave the Kings enough of a respite that they will be able to break loose offensively when they return to the ice at Colorado on February 26. Even though the Kings were still missing players who were participating in the XXII Olympic Winter Games in Sochi, Russia, they returned to practice on February 19, and have been hard at work, trying to address the problems in their game. Veteran defenseman Robyn Regehr, who is one of the better players to talk to about the nuts and bolts of the game, explained what “everything” meant. As has been reported in this space numerous times, the Kings’ offensive woes often start in their own zone, due to poor puck support—the gap between the forwards and defensemen are often too wide, making it easy for the defensive team to break up clearing passes and prevent the Kings from building speed on attack through the neutral zone, which renders their forecheck ineffective. Regehr confirmed that indeed, the Kings must play better in their own zone, improve their breakouts and generate speed through the neutral zone. Getting back to playing as five-man units is key, and that starts behind a team’s own net on the breakout. As Regher noted, a good breakout allows a team to move up ice as a five-man unit, and to generate a forecheck, along with the sustained pressure in the attacking zone that teams must have in order to score goals. Sustained pressure in the attacking zone is not something the Kings were known for during their last 21 games. Regher also pointed to penalty-killing as another Achilles Heel over the last six weeks. That the Kings have a some key aspects of their game that need cleaning up, is likely an understatement. Nevertheless, with the Olympic break over, there is virtually no time left to get their problems fixed. “It’ll be pretty tough to catch the [teams] above us, but all you can do is win games and hope for the best,” Richards added.